There are numerous uses for vines in the landscape. 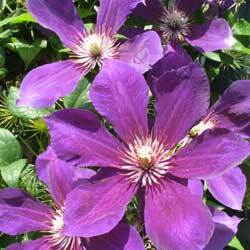 They can visually soften fences, walls and trellises or dress-up a lamp or mailbox post. They will provide summer shade when grown over an arbor, gazebo frame or pergola. Vines may be used to provide privacy by screening a patio or porch and can define any outdoor living space when used to create living outdoor walls or green barriers. If you want a thick barrier or screening look, opt for vines that will provide dense foliage, but if you prefer a more delicate vine, choose plants with more space in their foliage. Check flowering options, growth speed and how much training the vine will need to reach its full potential. At the same time, consider how the foliage is shed in autumn and how much care the vine may need to stay in good condition. Like any plant in your landscaping, vines will have specific needs for sunlight, soil condition and watering. Also consider the size of the space where your vine will live to be sure it won’t crowd out nearby plants or be stunted in a too-small space. Condition the soil appropriately to nourish your vine, and adjust a drip system or sprinklers to provide adequate water as needed. Vines need adequate support to stay upright and sturdy. Because vines climb in several different ways, support is critical. 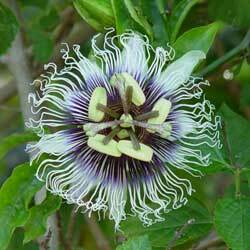 Wires, spirals, trellises, fences or arbors should support vines that use tendrils or a twining stem. Other vines attach themselves with aerial rootlets. These vines grow best on brick or stone walls. Some vines have no natural method to attach to a vertical structure and will just sprawl if not manually assisted with garden wire or string to an appropriate support. You will want your vine to thrive for many years to come, therefore you must select the right vine for your chosen location. 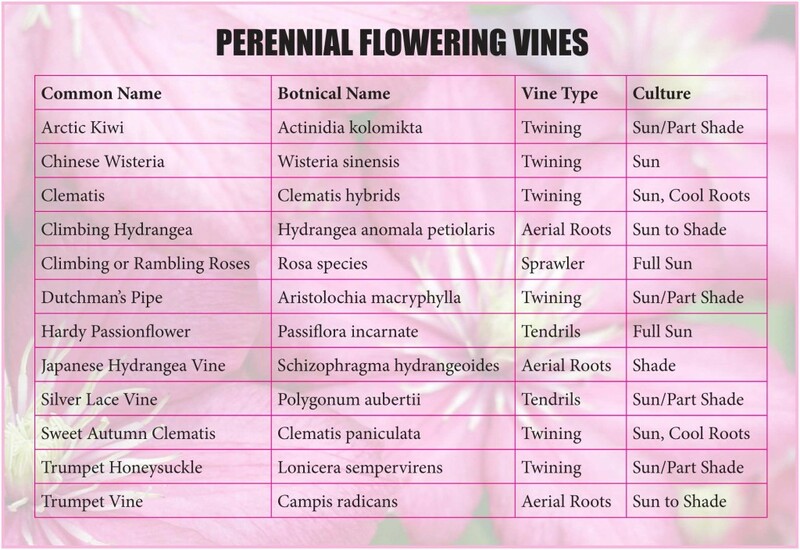 Use the chart below to learn about some of the more common, landscape-friendly vines you can welcome into your yard. Click the image above to view full size.